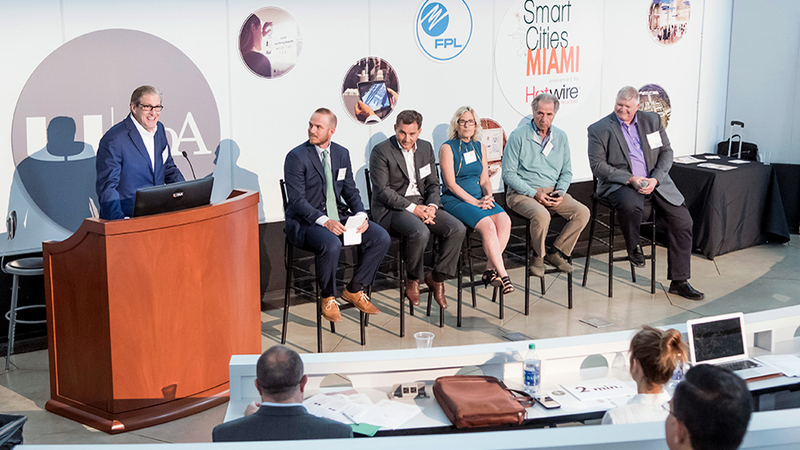 The School of Architecture and the Center for Computational Science jointly held their Smart Cities Miami Conference on UM’s Coral Gables Campus on April 5th and 6th. The conference, presented this year by Hotwire Communications, explored the convergence of technology, design, and development in the shaping of a new urban landscape transformed by design innovation and disruptive technology. Dean Rodolphe el-Khoury kicked off the event with a survey of ongoing activities in UM’s Smart Cities Program ranging from the mapping of informal settlements in Latin America with the help of digital technology to the design of a smart city in Mexico. “These projects position UM in the vanguard of the field and compel us to sustain with this annual conference, a public forum on smart cities,” said Dean el-Khoury who moderated the first panel titled “Design and Desires: Beyond the Practical City, “ featuring Amanda Sanfilippo, Curator for Art in Public Places, Miami Dade County Department of Cultural Affairs and Director and Chief Curator of Fringe Projects; Ivan Toth Depeña, an artist with a background in architecture specializing in technology-powered installations for public spaces; Nasrine Seraji, Founder and Principal of Atelier Seraji and Head of the Department of Architecture at the University of Hong Kong; Jordan Geiger, Assistant Professor of Architecture at SUNY Buffalo. The panel explored areas where city-making and technology align with motivations that exceed issues of optimization and efficiency. The panelists presented and discussed examples that expanded the scope of smart cities in enhancing urban environments and experience. The afternoon session began with “Mapping the Hyper-Connected City: Perils and Opportunities,“ a panel that took a critical look at smart cities. It was moderated by Leigh-Ann Buchanan, Founding Executive Director of Venture Café Miami, and featured Elizabeth Plater-Zyberk, Malcolm Matheson Distinguished Professor of Architecture and Director of Urban Design at U-SoA, Richard Grant, Professor and Director of Urban Studies in the Department of Geography (UM); Allison Schifani, a founding member of SPEC, an urban research and design collaborative and Assistant Professor of Digital Humanities (UM); and Danielle Ungerman, Co-Captain at Code for Miami. The panel confronted and debated some challenging aspects of smart cities such as the erosion of privacy and surveillance, problems inherent to processes of quantification and rationalization, issues of power, control and exclusion. “Smart Cities, From Efficiency to Sustainability,” the last panel and centerpiece of the conference, discussed the potential of new technology in building more sustainable, fulfilling and equitable cities. Examples included developments in smart buildings and energy, participatory e-governance next-generation logistics and transportation. It was moderated by Jay Massirman, President of Rivergate Companies (Real Estate Holding), featuring Rodrigo Arboleda, CEO and Co-Founder of Fastrack Institute, a non-profit entity accelerating exponential technologies into societies; Andrea Calace, Cisco IoT & Smart City Business Development Americas Senior Manager; Audrey Levi, Executive VP, Business Development for Inacomp Technology Solutions Group, aligning IT, processes and people to business goals; Jim Slattery, Senior Vice President of Advanced Technologies for Smart Cities Miami 2018, presenting sponsor from Hotwire Communications, an industry technology authority, and Matthew Zirkelbach, President and Co-Founder of RunBrook and Sustainabase, creator of proprietary sustainability metrics technology. The conference’s first day concluded with keynote speaker, David Benjamin, Founding Principal of The Living and Assistant Professor at Columbia University’s Graduate School of Architecture, Preservation, and Planning. He presented a variety of innovative projects that treat the city as a living organism with complex and interacting components. Generative design, enabled by computational infrastructure, fueled the creation of Mycelium-based building blocks designed to compost and disappear at the end of the building’s lifecycle. Generative algorithms enabled David’s group to design optimal solutions to problems ranging from sustainable and resilient building façades to ultra-lightweight and extra-stiff partitions for an Airbus aircraft. The Workshop on Day 2, “Hacking Main Street,” gathered teams of urban planners, architects, city officials, engineers and students to design smart systems for The Underline, Miami’s 10-mile linear park and urban trail that follows the Metrorail. Participants worked in multidisciplinary teams after receiving guidance from workshop organizers on key considerations for designing for the Internet of Things, such as system connectivity, embedded technology, big data, and user experience. The multidisciplinary teams competed for a prize that recognized innovation, entrepreneurship, and offered an impressive range of ideas that transformed the linear park into a smart corridor.